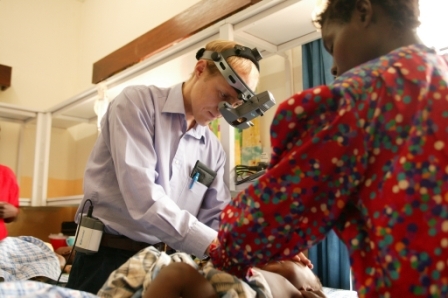 Dr Nicholas Beare, from the University’s Institute of Ageing and Chronic Disease, is photographed here at Queen Elizabeth Central Hospital, Malawi, examining a child for signs of cerebral malaria in the back of the eyes. Dr Beare is investigating malarial retinopathy as a diagnostic tool for cerebral malaria, a brain disease that results in the death of 800,000 children each year. To understand the condition better Dr Beare, as part of the Malawi-Liverpool-Wellcome Trust Clinical Research Programme, is looking for signs of the condition using sophisticated camera technology to image the back of the eyes. Children with cerebral malaria suffer with fits, which can result in a coma and, in severe cases, death. The brain suffers from lack of oxygen and blood due to blockages in tiny blood vessels. The Liverpool team have shown the impact of these blockages on neural tissue by imaging retinal circulation. Dr Beare explains: “Cerebral malaria is a particular problem in Africa, and is one of the leading causes of child death. Our research has shown that the only way to be certain a child has cerebral malaria is by the presence of malarial retinopathy. Many children come into the hospital in a coma, but by examining the eyes to look for signs of cerebral malaria we can be sure of the diagnosis and get them the correct treatment. “We have taken many retinal images of patients with cerebral malaria over the past five years and are now in the process of analysing them to get more detailed information about the condition. Comparing our data with findings from brain MRI studies is also helping us build a better picture of the damage caused to the brain.